Good ambience, wide variety on the menu, shisha, and good service; these things pretty much sum up everyone’s need in a place for a casual hangout. Thankfully, we found all of the above at Bonsai. Located in Zamalek, the villa-restaurant Bonsai is divided into three areas; two greenhouse-like areas by the streets, and the indoor area which is the ground floor of the villa itself. This indoor area is non-smoking, more quiet and cosy, with low key lighting and a lot of diverse seating options; whether you’re looking for high tables or comfy couches. You might think Bonsai is an Asian restaurant because of its name, but it’s actually more international. 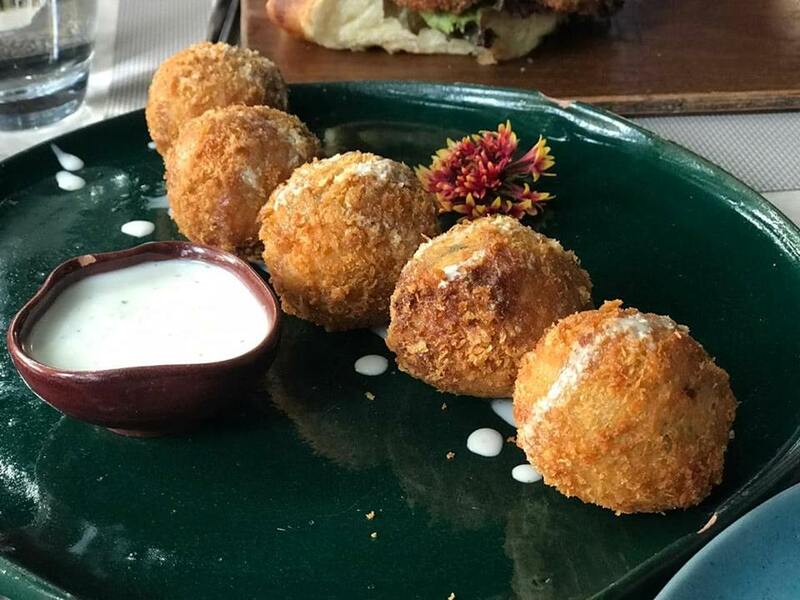 We kicked things off with Spinach & Bacon Arancini (95 LE) and Beef Roll-ups (130 LE) for the appetisers. Starting with the risotto balls, it had a fantastic crispy panko crust that we really enjoyed. 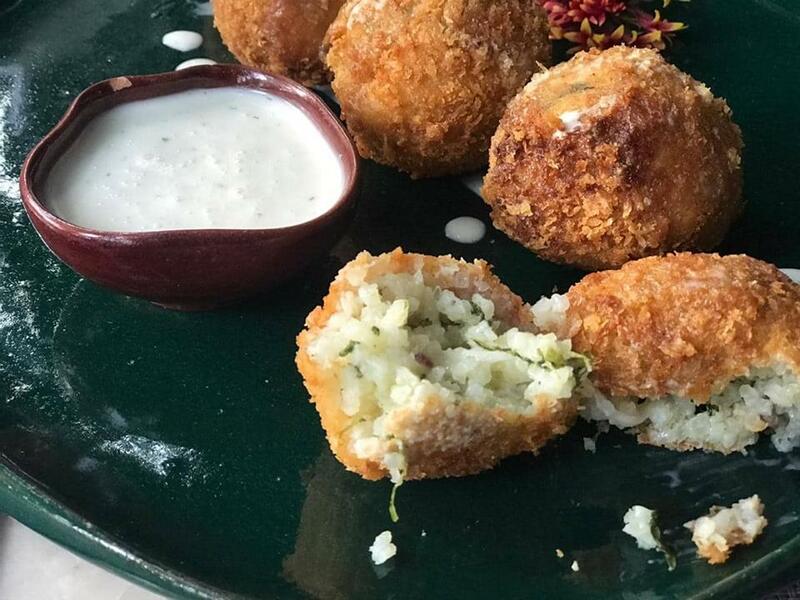 However, the filling had an extremely mushy texture, there was no bacon whatsoever, and serving arancini with watery ranch didn’t make any sense to us. The beef roll-ups, on the other hand, made up for the arancini. 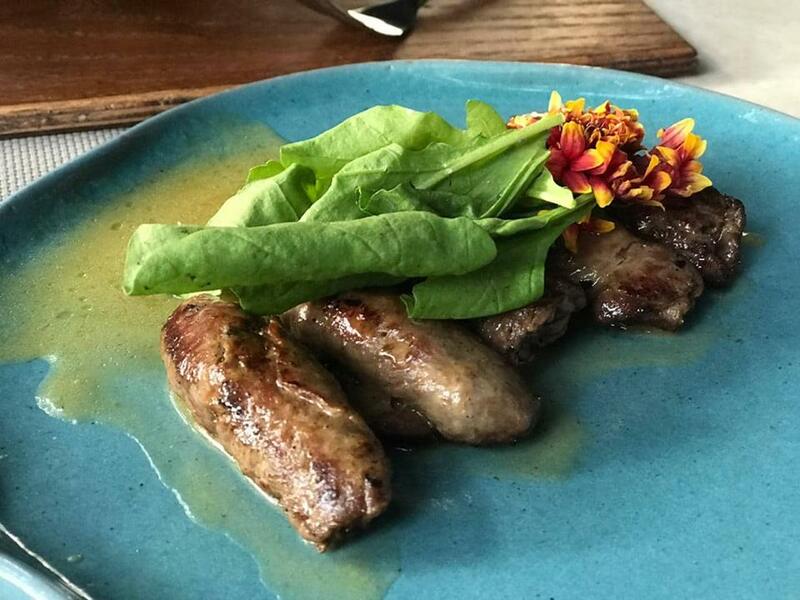 We really loved the thin, yet super tender and perfectly seasoned beef, which was filled with a good amount of mushrooms, and topped with fresh arugula. The watery ‘glaze’ was the only downside to this appetiser. As for the mains, we went with the Grilled Miso Salmon Steak (235 LE) and Fried Chicken Bun (110 LE). 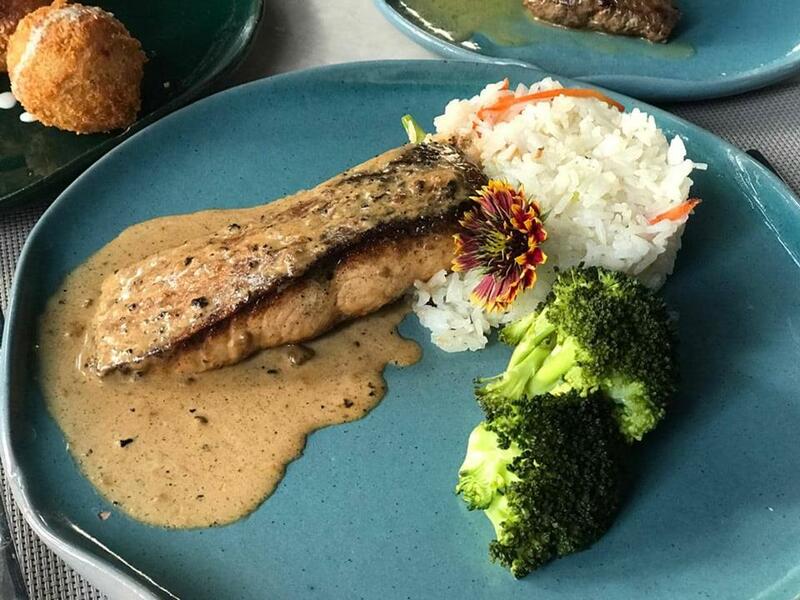 Served with steamed broccoli (that lacked seasoning), vegetables (that sadly didn’t make it to our dish), and fried rice (which was just plain white rice), the salmon was, thankfully, tender and flaky, and the creamy miso sauce had quite a range of interesting flavours. 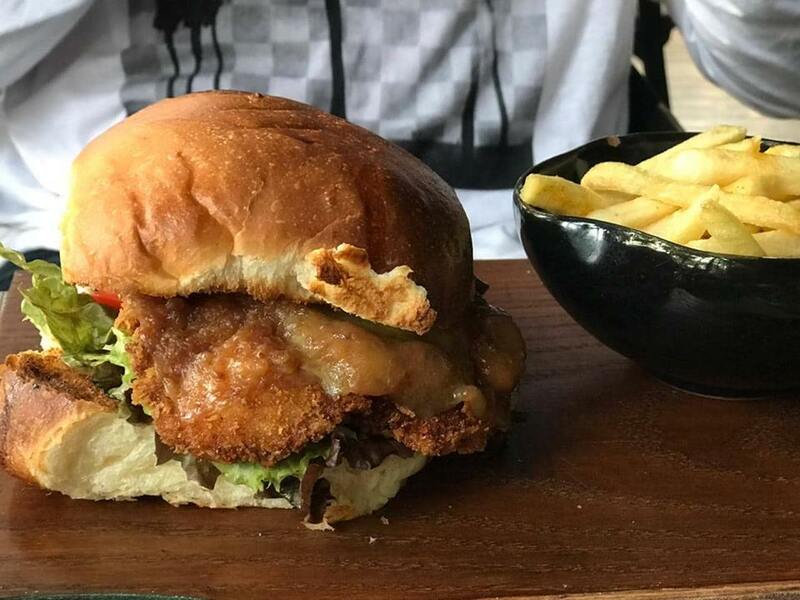 As for the Fried Chicken Bun, it was pretty much a classic breaded chicken breast with homely flavours. The star of the dish would definitely have to be the homemade bun that stole the show with its softness and deliciousness! We mean, if you’re capable of making a bun like that, then you definitely can go with more special toppings instead of just mayo, tomato, lettuce, and cheese. Also, the side of fries definitely needed a dip. We finished our meal with a Lotus Biscuit Berry Sundae (105 LE). 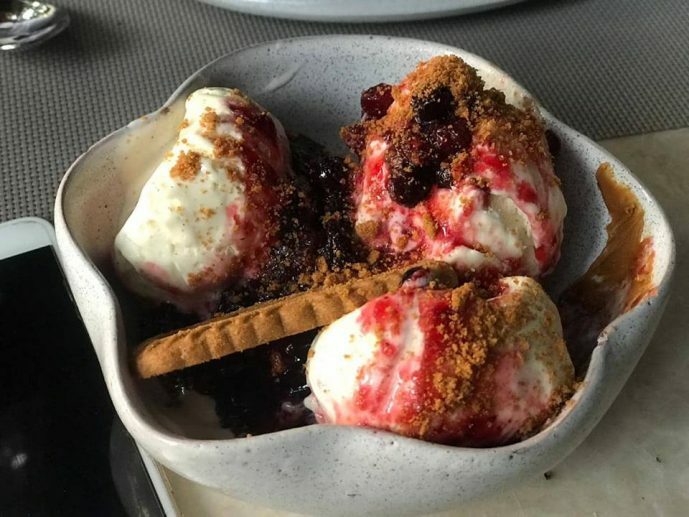 This dessert came in the form of a bowl with a piece of classic vanilla cake in the bottom, topped with vanilla ice cream, mixed berry compote, crushed lotus biscuits, and a minimal amount of Biscoff spread. We loved the overall flavours, but we wished that the Biscoff was drizzled on top. All in all, we had a good time at Bonsai. The food definitely had many flaws that need to be fixed, especially with these steep prices, but the overall experience was good, and the service was great. Bonsai has a breakfast menu and also serves sushi! The ambience and the chicken sandwich’s bun! Too many small flaws in the food.